Chrome-survey.info redirects are appearing on your computer because you have adware installed. The pop-ups invite users to participate in a survey to get a chance to win an iPhone 7 or Samsung Galaxy S7 Edge. It is a scam created by people who want to gain your personal information. The adware must have installed onto your computer along with free software. When you install freeware, you need to pay attention because all kinds of items could be attached to it. Adware is generally not malicious but it is not recommended to allow it to stay. For one, the pop-ups it will create will get on your nerves very quickly. It will also slow down your computer and make your browser crash much more often. We suggest you delete Chrome-survey.info immediately. Adware is usually attached to free software. If you want to stop it from installing together with the software, you need to deselect it during installation. You can do so in Advanced (Custom) settings of the installation process. Just uncheck the added items and you can proceed to install the software. The reason you are stuck with pop-ups and having to remove Chrome-survey.info is because you used Default settings and rushed through the process. If you do not want to end up with all kinds of unwanted items, we suggest you always use Advanced. 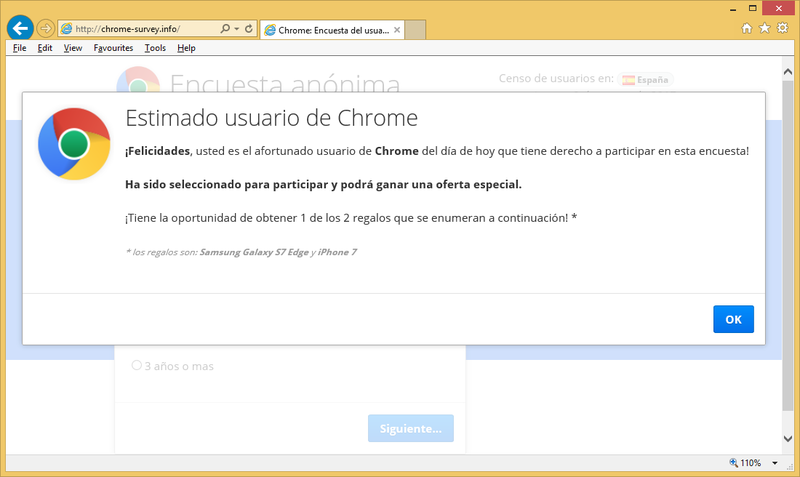 Chrome-survey.info pop-ups will appear on your Google Chrome browser. They will keep appearing at the most random times no matter where you click. The only way to get rid of them permanently would be to uninstall Chrome-survey.info from your system. Adware pop-ups usually offer users to obtain software but in this case, it wants you to provide personal information. The pop-ups will claim that you have been selected to participate in survey and have a chance to win one of two prizes, either an iPhone or Samsung Galaxy S7 Edge. It should be obvious but no one is going to give you anything, especially not such expensive phones, just to fill in a survey. Do not fall for these tricks. If you do take the survey, you will be encouraged to put in your private details. That acquired information may be used for malicious purposes in the future. This is all a scam. No matter how convincing it looks. If you start getting these ads, you should a get malware scanner and scan your computer. If the adware is found, delete Chrome-survey.info. Some users are not even aware that adware is on their computers. If they get a suspicion, they would have to locate the adware first in order to remove Chrome-survey.info. The adware is hidden somewhere on your system, so manual Chrome-survey.info removal may be very time-consuming. We suggest you get anti-malware and uninstall Chrome-survey.info using it. The pop-ups will stop after you erase Chrome-survey.info.